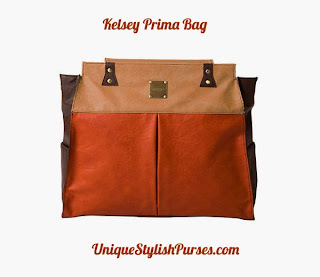 Rust faux leather along with complementary latte and cocoa piecing combine to create the smart and chic Kelsey for Prima bags. Contrasting dark brown stitching, brushed antique brass rivet accents, reversed side seams and a single deep pleat on the front and back further burnish her uptown vibe. Side pockets.